One of my favorite blogs to read is the Living The Gourmet. Gosh I wish she lived on my street. I found tonight's recipe on her blog the other day and had to try it. Quite delicious was the review from Chris. 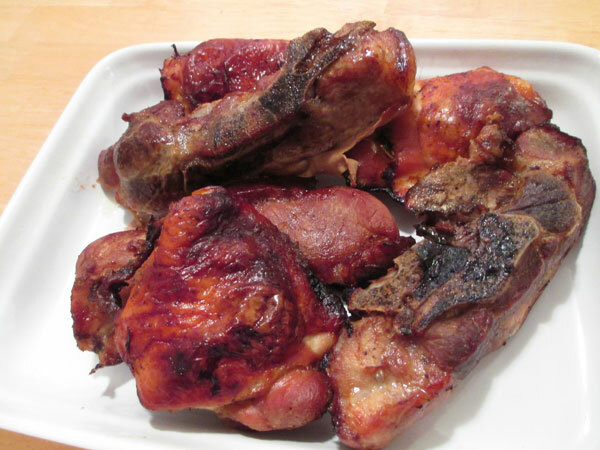 I let the meat sit in the marinade for a day and a half. It was so easy to prepare. Here is the recipe with my changes, yeah I did not use garlic! Combine all of the above in in a zip-lock freezer bag and mix well. Place in the refrigerator for at least one to two hours or up to over night. Preheat Oven 400 degrees. Put all the ingredients in 2 baking pans lined with foil. Place in oven and bake for approximate 90 minutes. Remove from oven and let sit for a minute. 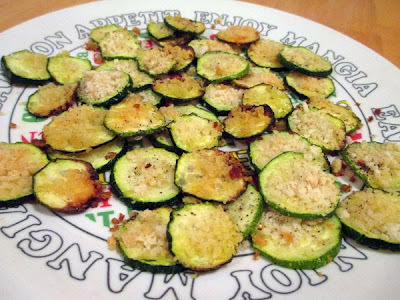 For side dishes I made my favorite roasted potatoes and I tried something new, Zucchini Parmesan Crisps. Again I found the recipe online, I think it was facebook. I copied it into the text edit and of course did not note who posted it. Sorry! They were nice. Definitely will make these again. Preheat oven to 400 degrees. Line two baking sheets with foil and spray lightly with vegetable spray. Slice zucchini or squash into 1/4 inch-thick rounds. Toss rounds with oil, coating well. Dear Lucia, From the first time I read your blog; it touched my heart. I knew that we were brought up in a similar family tradition. The family photo's confirmed that. My mom is gone 26 years this weekend. It is difficult to navigate through life without my parents. There is a huge void. I think that is why the Dear Lord brings people into our life. I consider myself very blessed to have met you. I am very grateful for your kindness and I wish you lived on my block too. I am sure we would laugh a lot and be great friends though I am grateful for the friendship our blogs have brought us.